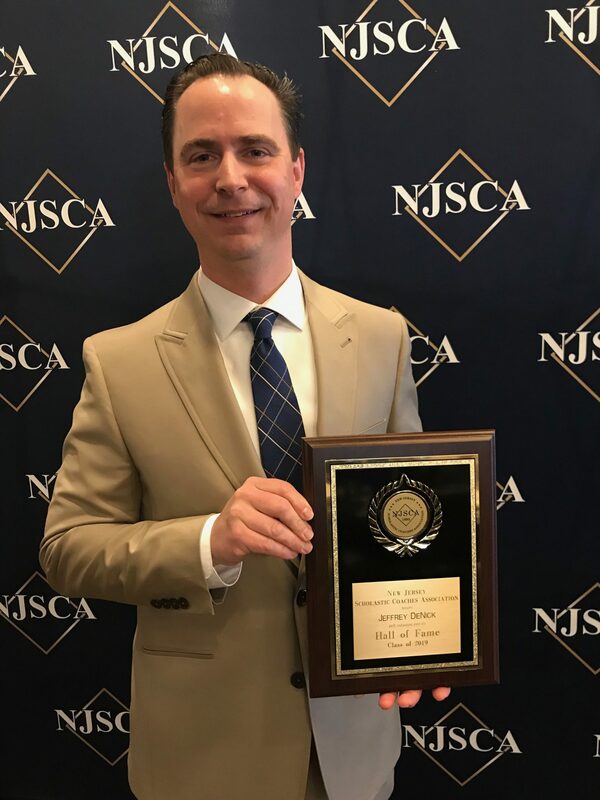 Jeffrey DeNick was inducted into the New Jersey Scholastic Coaches Association’s Hall of Fame. Swimming wasn’t Jeffrey DeNick’s sport growing up. He belonged to a swim club when he was 10 or 11, but he was never on any kind of swim team. So when he was first approached about coaching, he agreed with the attitude that’d he try his best and learn along the way. With his teams having nabbed two state championship titles, made 17 state playoff appearances and, at one point, completed a 48-meet winning streak, DeNick has become more than proficient on the subject of swim. On Sunday, March 24, DeNick was inducted into the New Jersey Scholastic Coaches Association’s Hall of Fame. DeNick was two years into teaching at Shawnee High School when he learned the boys’ swim team was in need of a coach. He was friendly with the girls’ swim coach, and so when he asked DeNick if he’d consider stepping in to help out the boys’ team, he admitted he didn’t have much experience with coaching. His colleague explained the girls and boys teams practiced at the same facility, and he could help show DeNick the ropes. So, DeNick spoke with Shawnee’s athletic director who said if DeNick was willing to learn, he was willing to take a chance on him. “I said, ‘I’m brand new.’ He said, ‘Everyone was brand new at one point,’” DeNick said. In 2001, DeNick got his feet wet. He met with the team’s six or seven senior captains and explained he didn’t have experience coaching and he was going to learn alongside them. The seniors helped guide DeNick along the way, and the girls’ coach taught him vital strategies, including how to scout out other teams and how to create a good lineup. The team made it to sectionals his very first year. DeNick coached at Shawnee for eight years until he decided to make a career move and transition from teaching to counseling, but it would also mean giving up his Shawnee team. In 2009, DeNick left Shawnee to serve as a guidance counselor at Delran Middle School. Around that same time, he heard that Moorestown High School’s boys team was in need of a coach. So, he reached out and introduced himself. This year marks a decade with the Moorestown Quakers. To date, DeNick has more than 190 career wins under his belt. Under his supervision, MHS’ Quakers have earned eight Burlington County Swim League Championships, five Sectional Championships and two New Jersey State Championships. DeNick said he is constantly setting new goals for himself. He said he’s always writing new practice sets tailored to his swimmers’ strengths and weaknesses. In the summer, the Marlton resident coaches the Stingrays at the Voorhees Swim Club. He said the club – where he teaches swimmers as young as 6 – gives him the experience of teaching someone who’s brand new to swim how to improve, and he often walks away from these summers with a new perspective and lessons to take back to his MHS team. While nabbing two state championship titles stands out as one of DeNick’s proudest accomplishments, he said there have been other smaller but equally important accomplishments along the way. From watching his swimmers improve and earn their best times to running into swimmers 10 years later who still fondly remember their time on the team, DeNick said these accomplishments are just as meaningful in his eyes. Bill Bruno, assistant director at the New Jersey State Interscholastic Athletic Association, said there are a number of factors that earn a coach a spot in the hall of fame. He said the nine-person committee weighs a coach’s longevity, impact on the athletic program, win/loss record and letters of recommendation when making its decisions. He said DeNick’s longevity at both Moorestown and Shawnee and his “beautifully written” letters of recommendation made him a standout – on top of his stellar win/loss record, of course. Bruno said out of 123 nominations, DeNick was one of 39 coaches to receive the 2019 honor. More than anything, DeNick said he wants to be remembered for creating a positive team atmosphere. He said he tries to make the program fun for his swimmers, and at the end of the day, while winning is nice, he’s always more than happy to hear from swimmers who look back fondly on their time on his team.